Daily scalp massages are one of the main ways I’ve been able to thicken my hair and lower my hairline. They are absolutely essential if you’re serious about getting back your healthy hair. But most people do it all wrong. And getting it wrong might even make your hair worse! In this article I’m going to share with you the best, time-tested and proven massage techniques that will powerfully boost your hair’s ability to regrow. First I’ll explain what scalp massages are and how they work. Then I’ll teach you what has worked for me, and what works for other visitors to this website. Next I’ll share some tips for getting the most out of a 10 minute daily massage session so you can maximise your results for the fastest possible recovery. Simply put, scalp massage (or head massage) is the manual stimulation of the scalp using hands or specially-designed devices. It’s a practice used for a variety of purposes, including headache relief and stress reduction. Another purpose that head massage serves is the growth of newer, stronger hair. This is a popular practice among the hair loss community, and one that can provide you with numerous hair-related benefits. Let’s take a closer look at the benefits of scalp massage, including how it can help you to regrow your hair. When hair loss occurs as a result of Androgenetic Alopecia (AGA), it’s due to the presence of DHT. 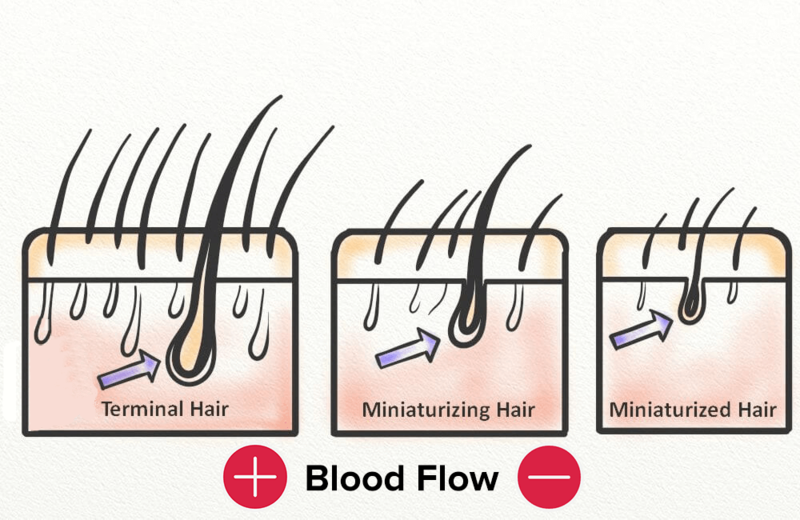 However, this triggers a process known as hair miniaturization, and this leads to decreased blood flow to the follicle. Essentially, inflammation occurs when DHT attaches to hair follicles that are sensitive (typically on the hairline and crown). This causes the follicle to miniaturize, and eventually the hair can no longer push through the scalp. If not treated, this leads to permanent baldness. Under the surface, however, another issue is occurring. This is the cutting off of blood flow. As the hair follicle miniaturizes, the connection between the bulb and the blood vessels is weakened. This is largely due to inflammation (1). When this happens, oxygen and nutrients are less able to make their way to the hair. In addition, waste (such as DHT and CO2) cannot be removed. So, while decreased blood flow isn’t the cause of hair loss, it’s a major contributor to continued hair growth issues. What’s the solution? Fortunately, scalp massage can improve blood flow to the scalp (2). If DHT is targeted simultaneously, it’s possible to return your hair follicles to their former health. As a hair loss sufferer, the growth of new hair may be your biggest concern. You’ll be happy to know, then, that regular scalp massage can have a beneficial effect on your hair growth efforts. In a Japanese research study, 9 healthy men received four minutes of daily scalp massage on one side of their head (3). This was done with a massage device, the Panasonic EH-HM75. 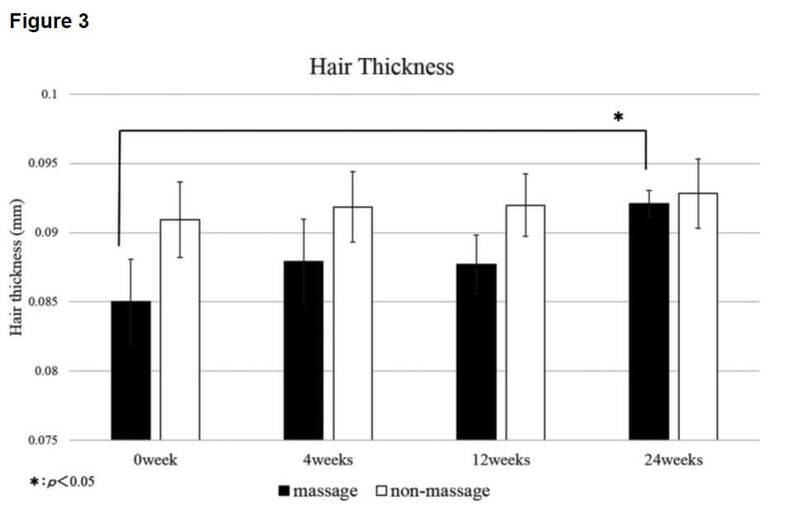 The total hair number, thickness, and growth speed were measured for each participant at 0, 4, 12, and 24 weeks. A folliscope was used for measurement. As hypothesized by researchers, there are two likely explanations. First is the obvious, increased blood circulation. Second is direct stimulation of mechanical force to dermal papilla cells. 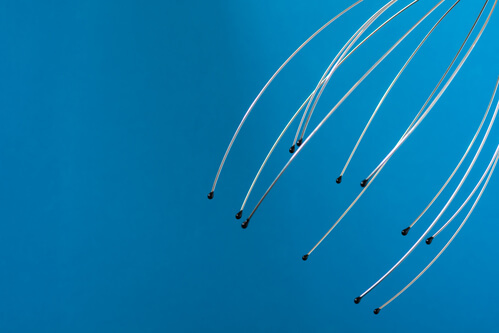 It’s believed that this enables stretching, which then makes it possible for hair follicle thickness to increase. 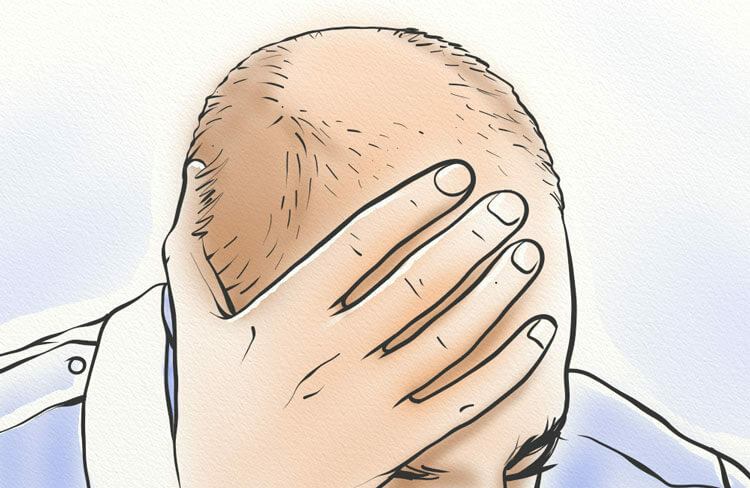 Stress is a common cause of hair loss, and it can occur acutely (a one-time event) or chronically. There are many ways to combat stress, but one of the more popular methods is massage. As we stress, our bodies tend to become tenser. This tension can then lead to feelings of more stress, and the vicious cycle continues. The effects of stress on hair loss have been proven and, most recently, in a 2017 study (4). The study consisted of 33 female students – 18 who were in the midst of exams and 15 who were not. As the study clearly showed, there was a marked increase in stress perception at T2 when the 18 students were in the midst of exams. But even further, the exam students experienced changed in cytokine balance. Cytokines are pro-inflammatory substances that are released by immune cells in response to injury, infection, or allergic reaction (5). When cytokine levels increase, this can indicate body-wide inflammation which can negatively affect the hair follicles. Scalp massage can be an easy stress reliever, and one that can work effectively to reduce mental stress and physical tension (6). The regular production of sebum – simply the scientific term used for skin oil – is an important part of a healthy and well-nourished scalp. However, the use of harsh chemical products and daily contact with outside pollutants can lead to a lowered sebum level. For obvious reasons, low levels of sebum production can lead to dryness and flaking. This can exacerbate hair loss due to itching and rubbing. Similarly, low levels of sebum can lead to an oily scalp. This is because your scalp will try to overcompensate and produce more oil that you need. Scalp massage is a great way to regulate the production of sebum and keep the levels on your scalp at a healthy and beneficial level. The particular method that I recommend, effleurage massage involves using the fingertips or hands to apply pressure to the scalp. This stimulates blood flow most effectively. Similar to effleurage massage but a bit more vigorous, petrissage massage involves the incorporation of rolling, kneading, and pinching motions into the session. This is perhaps a more efficient technique, as it covers more area in a shorter amount of time. However, it’s also easy to become too vigorous with this technique. As it involves a number of more sudden movements, this can lead to stress of the hair strands and follicles. If you’d like to perform this technique, pay special attention to your movements. This technique involves using the hands (or specialized tools) to create small vibrations on the scalp. 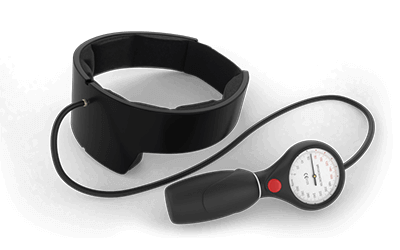 These vibrations can then stimulate circulation and enhance nerve activity. If you’d like to incorporate this particular technique into your routine, I recommend doing it only once or twice per week. There are more effective methods of stimulating blood flow, and it’s better to use those techniques the majority of the time. This is a gentler approach to massage, and one which involves the use of stroking motions to stimulate blood flow. The stroking motions are commonly performed with the backs of hands, but can also be done with fingertips or massage tools. Which Technique Is Right for You? The technique(s) you use will depend upon your own preference, as well as the tools you have available. I highly recommend the first technique (effleurage), though the incorporation of the other three techniques can also prove beneficial. However, the absolute best method for you will be the one that you stick with consistently. While a massage seems a simple enough practice, there are right and wrong ways of doing one. For best results, take a look at the instructions outlined below. The easiest method of scalp massage involves nothing but your hands. This can be done at home or on the go, and it’s a great introduction to the beneficial practice. To start, I recommend getting into a comfortable, quiet area. This may be your bed, your couch, or your desk at work. However, try to find a place where you can be uninterrupted. Begin at the sides of your head (just above the ears) and use four fingers on each side to work your hands in a circular motion. Apply varying levels of pressure, alternating throughout the routine. Slowly work your way up from the sides of the head to the crown. You can either go straight from sides to crown, or trace back every so often to the sides. Once you’re at the crown, continue working in a circular motion. Slowly work your way towards the front of your scalp (the hairline). You’ll then start at the very top of the hairline, and slowly move down and back to the sides of your head. At minimum, I recommend doing this for 10 minutes per day. This will provide you with enough time on each area of your scalp, and also ensure the experience is relaxing and stress reducing. If you’re in a hurry, or if you’d prefer a different method, you can also use a scalp massager with the same positive effects. There are different types of scalp massagers, but all serve the same purpose. To use the above massager, start by placing the tips on the top of your head. 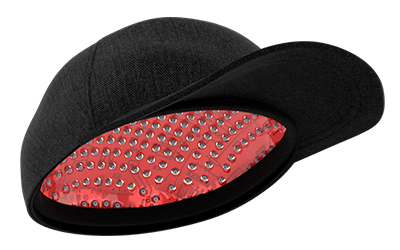 Slowly move the massager tool up and down, and rotate the massager in circular motions to get all areas of the scalp. This tool is best for the crown and sides of the head, but there’s another massager tool you can use for the hairline. The massage brush is a small, rubber tool that enables you to target specific areas of your scalp. This is great for individuals with complete baldness or with very short hair (otherwise, hair can become stuck in the rubber bristles, or pulled). To use, place on the area of the scalp you would like to target and apply light pressure. Begin to move the brush in a small circular motion. To vary movements, you can increase and decrease the sizes of the circles. To further boost the benefits of scalp massage, I recommend you combine your massage sessions by adding in an oil. Which Oil Should You Use? There are many essential oils and carrier oils that can bring additional benefits to your scalp massage routine. However, the oils you choose will depend on your goals. For example, rosemary oil extract is great for use as a topical DHT blocker (7). Peppermint oil can be used to further promote blood circulation (8). Or, almond oil can be used as an antioxidant and hair growth promoter (9). Using the oil (or combination) of your choice, pour a quarter-size amount into your palms. Rub your hands together to warm the oil. Start by applying the oil at the crown, and massage in a circular motion (just as you would without the oil). Spread the oil evenly as you massage, bringing it from the crown, to the sides of your head, to your hairline. You may find that you need more oil. Continue to add small amounts to your palms and apply evenly. NOTE: If using an essential oil, be sure to dilute every drop of oil with 5mL of carrier oil. This will reduce the risk of contact reactions, as well as deliver the essential oil more effectively. Only apply enough oil to create a thin coat on the scalp. You don’t want to saturate the hair. Once you’ve completed the massage (5-10) minutes, let sit for an additional 5-10 minutes. Then, rinse thoroughly with lukewarm (or cold) water. You can repeat this on a daily basis, or only do it occasionally for a boost to your current massage routine. If you want to ensure you’re getting the most from this technique, here’s a few tips to implement. A common mistake made by many is the use of their fingernails during a scalp massage. This can significantly damage the scalp and hair follicles, as well as negatively impact the results of the massage. A common mistake is inconsistent massage sessions that leave much to be desired. If you aren’t spending the time and effort, you won’t see the positive results. For best practice, I recommend 10 minutes per day. You can easily fit this in at any point, whether upon waking, at your desk, or before bed. When you perform the same routine day to day, it’s easy to become lax. Additionally, you may be missing areas of your scalp. This is why I recommend you vary your routine from time to time to ensure the entirety of your scalp is receiving equal attention. What do I mean by varying routine? First, you can use different techniques (such as those outlined above) and incorporate them into your regular massage routine. Second, you can work “backwards” (starting at the hairline and moving to the crown and sides) as a way to mix it up. While it’s important to avoid applying excessive pressure (this can pull out hair and damage the follicles), pressure is necessary to see positive results. So, how much pressure should you apply? Simply, you want to apply enough pressure to be worthwhile, but not so much that you’re in pain (either your scalp, or your fingers). If your hands or fingers are cramping during/after a session, you’re likely applying too much pressure. Similarly, if your scalp doesn’t feel like it’s even been massaged five minutes after your session, you’re likely applying not enough. Determining the right amount will take some experimentation, but it’s important to find that happy middle. Is Scalp Massage the Real Deal? A common problem that hair loss sufferers have with scalp massage is that it seems too easy. This leads them to avoid the practice altogether. However, I recommend you give it a shot for at least three months. You really have nothing to lose and everything to gain (namely, hair). Massage is a common alternative health practice, used to improve blood circulation and decrease tension. However, it can also be a good hair growth stimulator. Of course, scalp massage alone won’t get you the results you crave. Instead, I recommend you combine hair growth methods – including diet change and supplements – to see a noticeable difference. Hello, thanks a lot for your information you share. I’m using some of the methods to regrow hair. The current situation is that my vellus hair has grown longer, from a few mm to 1 -2 cm. But only a few have changed to terminal hair (became brown). Do you have any idea how to accelerate the amount of vellus hair which becomes coloured again? Because this happens verly slowly, but it happens. The most effective way is probably the use of microneedling. Have you tried using a dermaroller or dermastamp yet? Yes, but not regularly. I will use a 0,5 mm dermaroller now one time a week. Thanks. Have male hair follicles on the top of the scalp been proven to be genitically different from other follicles on the side or back of the head? If that’s not usually the case, then isn’t poor blood flow the primary culprit of male-pattern hair loss? Hi J, the jury is still out about if hairs are genetically different on different parts of the head. 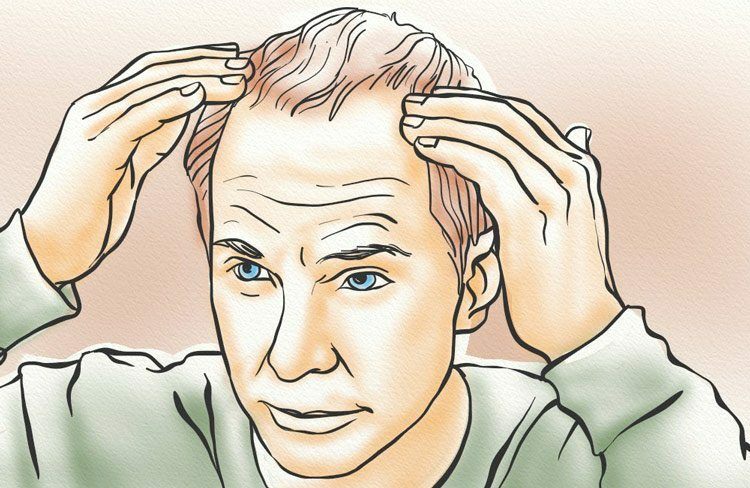 However the evidence is quite clear that areas of high scalp tension, and therefore poor blood flow strongly correlate with the typical pattern of male pattern baldness. Reducing the scalp tension has been shown to help the hairs regrow. For example, the botox study. Here is a simple technique from my meditation class on how to relax muscles. First you breathe in and notice that you have tension in your muscles (e.g. the muscles in your head). Then you breathe out and release the tension in the muscle, just by releasing the tension. This is important: Don’t try to push the tension in the reverse direction, just release the tension. Breathe in and know that you have tension – breathe out and release the tension. It will take a little bit of practice and time, but it works. Thanks, that’s useful to have your input. Certainly, some sort of conscious relaxation/breathing and meditation is proven to reduce stress and muscle tension. Definitely worthwhile.